How to decompress in a hurry. The vast majority of people have bad days for no good reason. That’s life. Moods go up, moods go down. To sigh and say “ugh” is human. Of course, there are those living exclamation points who pop off upbeat sayings like “turn that frown upside down” whenever they see someone looking blue. These militantly cheerful types never have bad days because their moods are permanently stuck at “yay!” It is my opinion that these talking sunbeams should be pitied. The ancient philosophers said “know thyself” and I do: I’m a natural born grump. My astrological sign is Eeyore with an Abe Simpson rising. This doesn’t mean I’m not also a fun and positive person. I can be, in fact, an utter delight to be around. But I usually have to improve my mood first. I prefer to do this with minimal effort and expense. There are simple things you can do to give yourself a wee boost if you get stuck in a slump. Allow me to share them with you. Why would I do that? Because I am magnanimous. A delight to be around. These tips are not based on any kind of reputable research. I am not a doctor or a scientist. My only qualification is that I write articles on the internet, which is a very rare and valuable skill. These suggestions are based on my experiences trying to shake off cases of the late-afternoon cranks. I have done each of these things multiple times to adequate success. Try them out. I do not require thanks. 1. Splash Water On Your Face In The Bathroom: There was a scene in a movie I once watched where the main character went into his bathroom, splashed water on his face, and then stared intensely into the mirror. This is something that movie characters do all the time. It’s a trope, if you will. So I tried it and it works. Whenever I’m feeling stressed out, I take a moment, dramatically splash a little water on my face, look at myself in the mirror and say, “John, you’re going to be okay.” This is shockingly effective. Thanks, movies! 2. Listen To Music That Makes You Want To Punch The Air: Listening to a favorite song is a perfect way to reboot. But it is important that you punch the air when you listen to that favorite song. I’m not suggesting you violently throw knuckles. But bouncing up and down to a beloved tune while trying to gently fist-bump angels gets the blood moving and triggers stress-reducing brain chemicals. The music I jab to includes Abba, Bruce Springsteen, and Taylor Swift. Sometimes I mix it up and joy-box to the Moana soundtrack. 4. 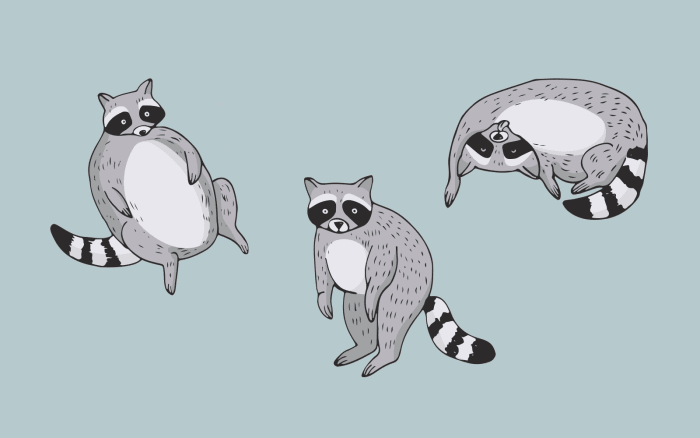 Watch YouTube Videos Of Raccoons: Raccoons are like little bear-monkeys with tiny hands. They are one of the most amusing animals that the process of evolution has produced. Here’s where this gets good: There are thousands of videos on YouTube of raccoons behaving like mischievous fur goblins. There is one video, in particular, that shows a raccoon sneaking up on a bowl of cat food, grabbing the food in its little fingers, and then running away on its hind legs. This video, without fail, puts me in a good mood. If, for whatever reason, you don’t like trash pandas, then you’re still in luck because YouTube has videos of otters, too. Otters are love weasels. 5. Sit In A Stairwell: Sitting in a stairwell for five minutes is my top-secret method for defeating the doldrums. It has never failed me. There is always a stairwell nearby. Stairwells are almost always empty. I sit on a stair and breathe. I inhale and exhale. “In with the love, out with the baloney.” That’s a little prayer I like to say when taking five in the office stairwell. You are free to use it. I will, on occasion, use my time in the stairwell to meditate, which then turns into a nap. All problems can be solved by sitting in a stairwell. Just sit there. Alone. In the stairwell. I did this today. I took a moment. The day was long. I sat between the 12th and 11th floors. Hands in lap. Head low. A door creaked open above me. Voices. Indistinct, but serious. Footsteps on a landing. The concrete I was sitting on was cold. I closed my eyes. I became the stairs. They’re called flights of stairs because the steps can lead up, up, up to heaven. More footsteps. They will walk on me and not know I am there, I thought. I heard more shuffling and voices. Then a door closed. No one found me. I returned to work.